Hiver Admins can enable or disable specific Hiver features for all the users on the Hiver account. Click on the green gear icon and click on the 'Admin panel' to see the Dashboard. Click on the gear icon(5th from top) to go to Settings. Select 'Feature Access' to see the list of features that you can enable/ disable. This option controls the enabling/ disabling of the 'Send Later' feature for the users on your Hiver account. The 'Send Later' feature allows you to schedule emails to be sent at a later date. You can find the scheduled emails in your Gmail Drafts. This option controls whether or not you want the emails assigned to a user to get copied to her Inbox. This option controls the enabling/ disabling the 'Sync Read Status' feature for the users on your Hiver account. 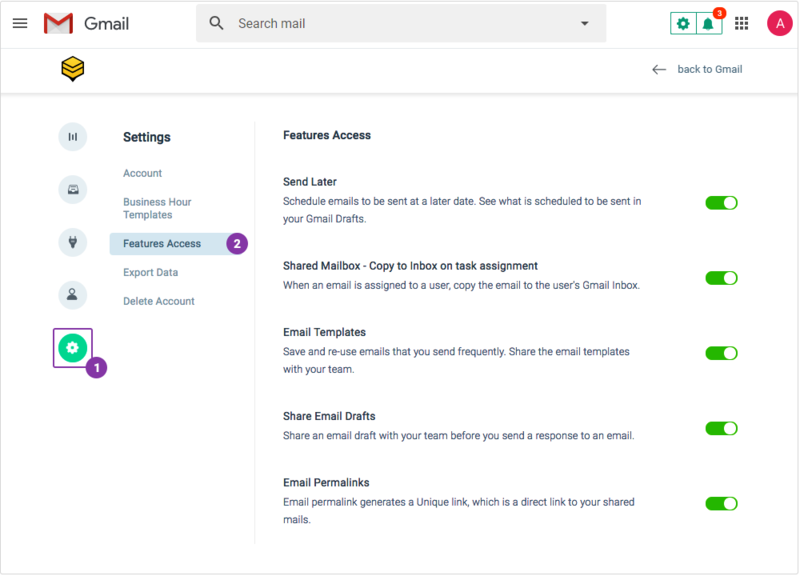 This feature enables you to sync the 'Read' status of emails with Shared Labels across all the users with whom the same email is shared with. eg, if one person reads an email, then the email is shown as 'Read' for all the other users. This option controls whether or not you want the sub-labels for a given Shared Label to get shared automatically. This option enables/ disables you to use Email Templates in your Hiver account. Through this feature you can save all your repetitive responses in templates and embed them in your emails. You can share the Email Templates with all the users on your Hiver account. This option enables/ disables the Shared Drafts feature for all the users on your Hiver account. Through this option you can share an email draft with other users and also notify them of the same. You can enable/ disable the Email permalink feature through this option.